Memory is the mental function that enables you to acquire, retain, and recall sensations, impressions, information, and thoughts you have experienced. There are several different types, stages, classifications, and functions of memory. Most people think of memory as either short-term or long-term. However, memory can be divided into many more types or categories. We categorize short-term and long-term as stages of memory than types of memory. Types of memory are mostly subsets of long-term memory. There are three memory stages: sensory, short-term, and long-term. Information processing begins in sensory memory, moves to short-term memory, and eventually moves into long-term memory. Information that you come across on a daily basis may move through the three stages of memory. However, not all information makes its way through all three stages. Most of it is forgotten somewhere along the way. The determination of what information makes its way through the different stages depends on what you pay attention to and process. Information that you pay attention to and process will move to the next stage of memory. However, any information you to do not pay attention to never makes it way to the next stage. Sensory Memory processes information from the environment and holds it for a very brief period of time, generally for no longer than a second. Sensory memory retains impressions of sensory information after the original stimulus has stopped. Most of the information that gets into sensory memory is forgotten, but information that we pay attention to passes into short-term memory. Iconic memory is the visual sensory memory that holds the mental representation of your visual stimuli. Echoic memory is the auditory sensory memory that hold information that you hear. Haptic memory is the tactile sensory memory that holds information from your sense of feeling. Short-term memory is also known as working or active memory. It is the information we are currently thinking about. Information in short-term memory is not stored permanently. Most of the information stored in short-term memory will only be kept for approximately 20 to 45 seconds. While many of our short-term memories are quickly forgotten, paying attention to the information and processing it allows it to continue into long-term memory. Short term memory not only has a limited time, it also has a limited capacity. It believed to only hold a few items. Research shows the number is around 7 +/- 2 items. Long-term memory refers to the storage of information over an extended period. It is all the memories we hold for periods longer than a few seconds. The information can last in our long-term memory for hours, days, months, or years. Although we may forget at least some information after we learn it, other things will stay with us forever. Unlike short-term memory, the capacity of long-term memory is seemingly unlimited. Explicit memory are those experiences and information that you have to consciously think about to remember. When you are trying to intentionally remember something such as the name of someone you met or a list of items to pick up at the store, this information is stored in your explicit memory. 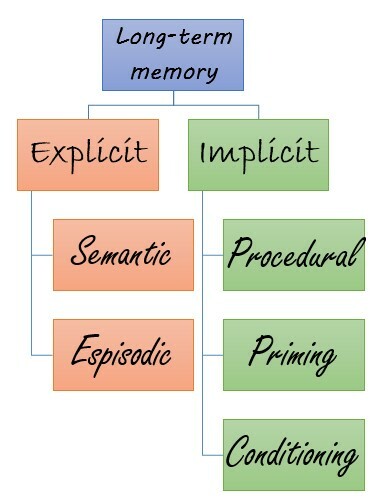 It is termed explicit memory because you can name and describe each of these remembered things explicitly. It would include consciously remembered knowledge or experiences such as information, episodes or events. This type of memory is also known as declarative memory, since you can consciously recall and explain the information. 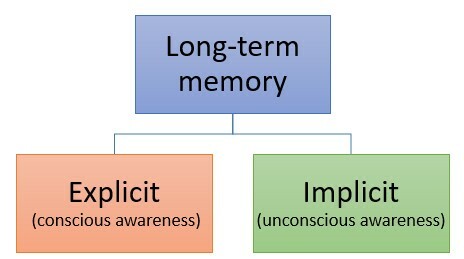 Implicit memory refers to knowledge you remember unconsciously and effortlessly. It is remembering without awareness. You use implicit memory when your previous experiences aid the performance of a task without conscious awareness of these previous experiences. For example, you would use your implicit memory to ride a bike or drive a car because you can do so without having to consciously think about it. Instead of implicit and explicit, some people use the terms declarative and non-declarative (or procedural) to differentiate the two main types of long-term memory. 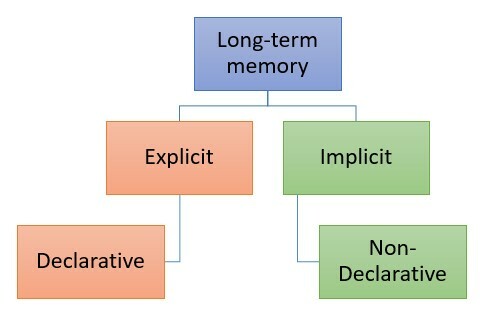 Declarative memory is another term for explicit memory. Explicit or declarative memory requires conscious recall. It consists of information that is consciously stored and retrieved. Non-declarative memory is another term for implicit memory, because it is expressed by means other than words or you are not able to consciously bring it into awareness. For example, when you ride a bike, you are expressing memories of motor skills that do not require the use of language. 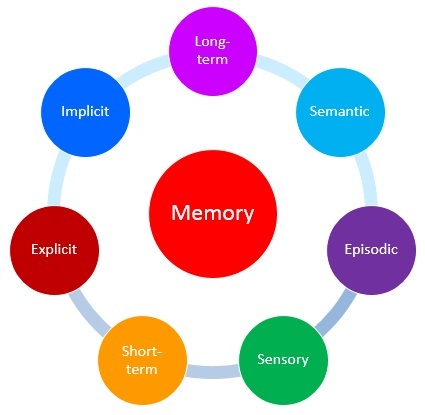 Explicit memory or declarative memory can be further subdivided into semantic memory and episodic memory. Episodic memory is the ability to remember episodes of your life. It refers to the firsthand experiences that you have experienced in your life. For example, if you were ask to tell someone what you did last Saturday, you would need to mentally travel through the day in your mind and state the events of your day. Semantic memory stores your knowledge of facts, concepts, names, and other general knowledge information about the world. (i.e. 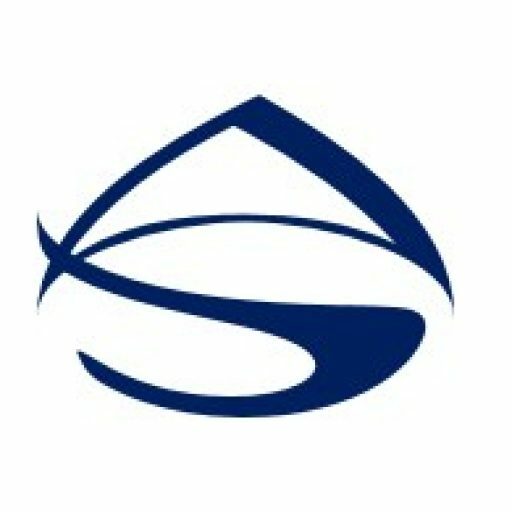 the names of the football players on a team, definition of the word “abstract”). If you were given the task to list the ingredients in cheese cake, you would not need to “time travel” in your mind. You may simply recall the data. Implicit memory involves recollection things that you do not purposely trying to remember. It is both unconscious and unintentional. The three types of implicit memory are procedural memory, classical conditioning, and priming. Procedural memory is implicit memory for skills and motor movements. It involves those skills and tasks you learn and perform without conscious awareness. Procedural memory enables you to perform many everyday physical activities without having to give it any thought. Examples of procedural memory include walking, riding a bike, tying shoes, making a sandwich, and reading. Classical conditioning refers to the unconscious awareness of an association of one stimulus with another stimulus. The memory for the association is demonstrated when the conditioned stimulus begins to create the same response as the unconditioned stimulus did before the learning. For example, if you hear a dinner bell ring, it may create a naturally occurring response such as excitement or salivation. Another example is if you heard there was going to be a test, you begin to get tense and nervous. Priming is an effect in which exposure to one stimulus influences the response to another stimulus due to prior experience. Basically, priming influences your flow of thoughts. It is a non-conscious effect that activates particular concepts or associations in memory. The theory is that when you are exposed to something enough it will rises from your subconscious to the surface of your consciousness. For example, if ask to state an animal that begins with the letter “D”, most people would choose “dog” because it probably the most popular. However, some people may choose “deer” because of particular connection. You can often predict how a person will respond based on the priming stimulus. What do you think most people would pick for a tool beginning with the letter “H”…Hammer? Since it occurs outside of your conscious awareness, it is your implicit memory. Often, you do not consciously recall seeing the priming stimulus that affect your action.